Bill Cosby once said, “Fatherhood is pretending the present you love the most is soap-on-a-rope.” As children all over the country prepare to honor their dads for Father’s Day or a special birthday, it might be time to say “no” to the soap and ties and give him what he really loves – a home-cooked meal. In a 2012 survey of more than 2,000 American adults, Harris Interactive asked men and women about the best gifts for their dads. While a new tablet or smartphone came in at No. 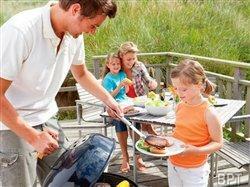 1, the second thing dads want most is a home-cooked meal. For most of us, tablets and smartphones might be out of reach, but a home-cooked meal is just what the budget ordered. And what home-cooked meal do dads love the most? According to a study (featured on the Today Show) that examined the intersection between food taste and gender, men tend to prefer salt-fat combinations (burgers, pizza, chips). When it comes to comfort food, men turn to steak or stews. Simply put – men like meat. So this year, when it’s time to honor your dad, consider hosting a family barbecue with all of Dad’s home-cooked favorites. Whether you choose mouth-watering steak burgers, bone-in ribeyes or finger-licking good Kansas City barbecue, the options are almost endless for a home-cooked meal that Dad (and your friends and family) will love. If you don’t know where to start your menu planning, you can find some great barbecue ideas online. Be sure to check out the recipe and cooking tips from The Kansas City Steak Company. Simply select your favorite category and you’ll receive helpful tips and tricks for a delectable meal with recipes created by talented chefs and home cooks across the country. With more than 600 recipes to choose from, you’re sure to find just the right meal to honor your dad. Once you’ve selected the perfect meal for your dad, don’t forget to check out these top 10 grilling tips to maximize flavors and minimize flare-ups. Whether your dad wants to navigate the grill himself – after all, it is his day – or he allows you to take over for the day, grilling your meat-of-choice to perfection is easy when you follow a few simple rules. There’s even a grilling app to give you on-the-spot tips and timing. So this year when it’s time to honor your dad, look no further than your computer, your creativity and your freezer for a gift he’ll treasure – memories made together enjoying a home-cooked meal.